I have written about Coach Farms goat ricotta in other posts, it’s great in lasagna and for making gnocchi. I love it in this recipe as well. It’s more flavorful, creamier and less chalky than other ricottas, and it is lower in fat and calories than even part-skim ricotta. I find it at Whole Foods and PCC in Seattle. 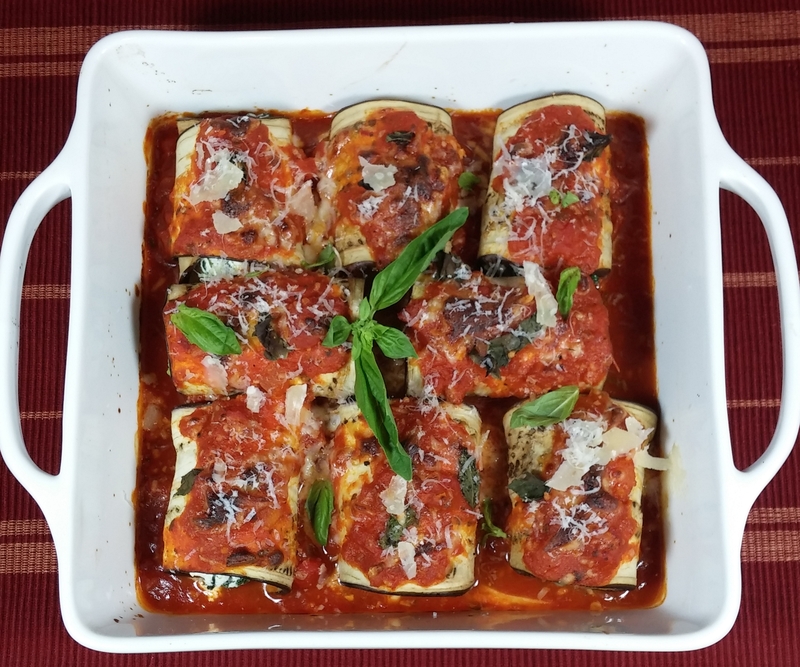 If you aren’t a big lover of eggplant, or don’t think you like eggplant, I encourge you to try this recipe anyway. There are two reasons that people generally don’t like eggplant: the texture and the bitter flavor. This texture of the eggplant in this dish is melt-in-your mouth, and the bitterness is extracted from the eggplant with salt prior to cooking. I recommend salting eggplant to extract the bitter liquid prior to using eggplant in any preparation. I salt eggplant slices prior to making eggplant parmesan, and I salt it is cube form prior to making ratatuille. The only time that I don’t use the pre-salting technique is if I’m using a small Japanese or Chinese eggplant. These varieties don’t seem to have the same bitterness as the larger varieties. This recipe serves 3 generously and 4 moderately. 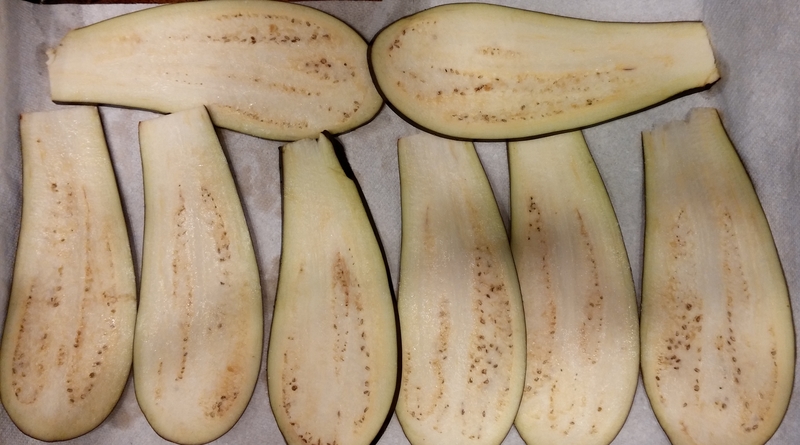 Thinly slice eggplant lengthwise on a mandoline into 1/4 inch slices, (reserve non-uniform end pieces for another use). Place eggplant slices on paper towel sheets and sprinkle with a few pinches of salt. Set aside for 10 minutes to allow salt to draw moisture from eggplant slices . Combine ricotta, spinach, lemon juice and zest, garlic and salt and pepper in a bowl. Mix thoroughly to combine and set aside. Pour 1 cup of marinara sauce into an 8x8 baking dish. 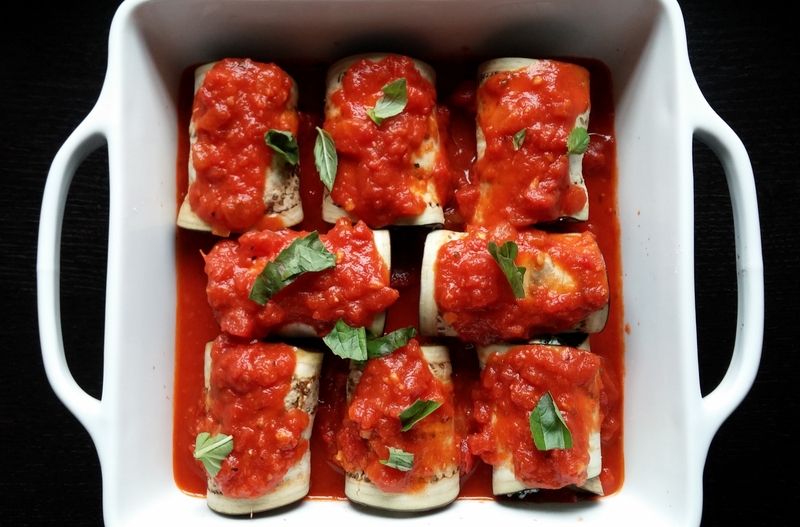 Place eggplant slices on parchment-lined baking sheet and cook for 5-8 minutes on top rack of oven until eggplant has softened (you will need to do this in two batches). Allow cooked eggplant to cool before assembling rollatini. 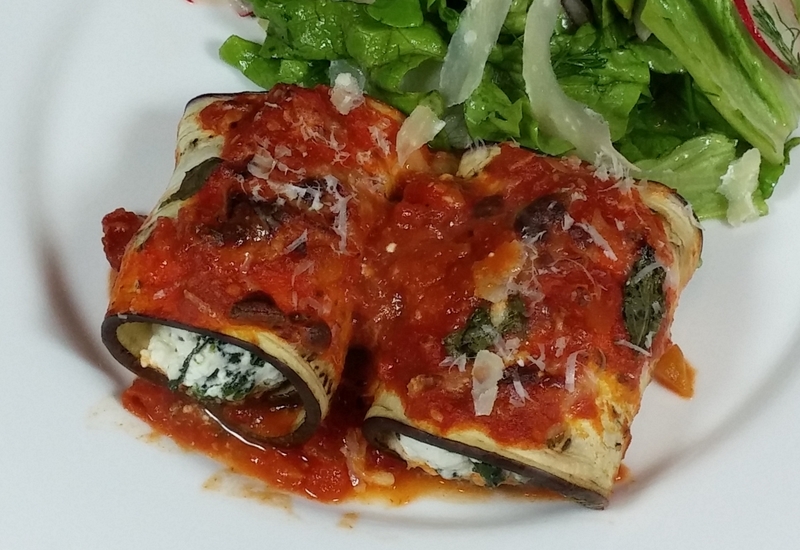 Assemble rollatini by placing a few tablespoons of the ricotta mixture on each eggplant slice and rolling the eggplant around the filling. Place rollatini seam side down in baking dish. Top rollatini with remaining marinara sauce, torn basil, and cheese (if using). Cover baking dish tightly with foil and cook at 350 degrees for ~50 minutes on the center oven rack. If using cheese, uncover for last 10 minutes of cooking to allow cheese to brown. *Spinach adds a lot of flavor and fiber to this dish. If you don't like the fiberous texture of the spinach, you could make this dish with zuchinni instead. Substitute one zuchinni that has been grated and sauteed with garlic in a little olive oil for the spinach.